"Today, The Loftus Store offers many unique souvenirs, gift items, books, clothing, mugs, and more! 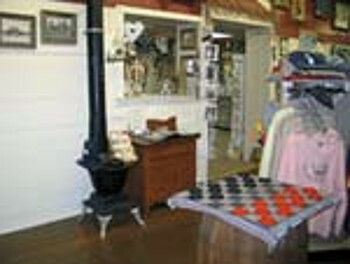 The store is considered a featured stop on your Laura Ingalls Wilder Tour and is one of two original buildings on main street from the 1800's"
Daniel Henry Loftus was born in Scranton, PA, on March 9, 1853. He grew to manhood in his native city. It was late 1879 when Mr. Loftus came to De Smet and established a general merchant store with his old chum Billy Broadbent. 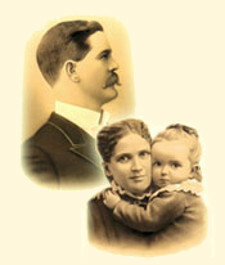 Loftus soon bought him out and business continued in the same old building up to the time of his death in 1921. The original building still stands today and is full of merchandise and Laura Ingalls Wilder souvenirs, t-shirts, dolls, and books. 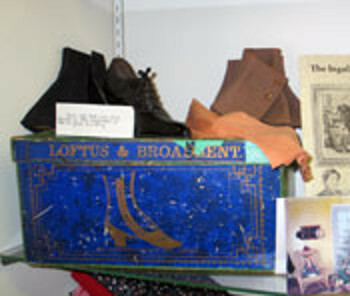 Shoe boxes and a shoe that were sold in the Loftus store were found in the attic, and are on display now, one hundred seven years later. Shoe boxes and shoe found in attic.